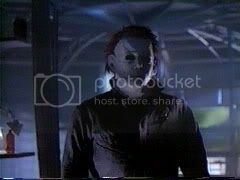 Halloween 6: The Curse of Michael Myers is a 1995 American horror film and the sixth installment in the Halloween series. Directed by Joe Chappelle from a screenplay by Daniel Farrands, the plot involves the "Curse of Thorn", a mystical symbol first shown in Halloween 5: The Revenge of Michael Myers and revealed in the film to be the source of Michael Myers' evil. The cast includes Paul Rudd as Tommy Doyle, a returning character from the original Halloween film, and Donald Pleasence reprising his final role as protagonist Dr. Sam Loomis. 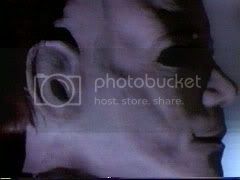 The character of Jamie Lloyd appears briefly in the beginning of the film to tie up loose ends to Halloween 5: The Revenge of Michael Myers. 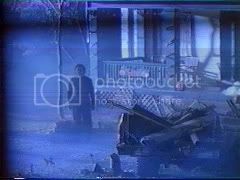 Six years after The Revenge of Michael Myers, Michael and Jamie are believed to have died in an explosion at the Haddonfield Police Station. It is revealed that the Man in Black is a leader of a Satanic-like cult, and that the Man in Black kidnapped Jamie and had her impregnated. The baby is born on Halloween Eve and is carried away by the Man in Black. 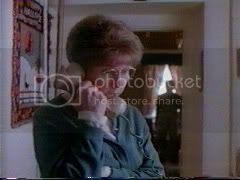 Later that night, however, Mary (Susan Swift), a nurse, helps a now teenage mother Jamie (J.C. Brandy) and her baby escape. 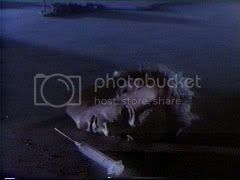 Michael (George P. Wilbur), in pursuit of Jamie and her newborn, kills the nurse by impaling the back of her head to a metal spike in the wall. 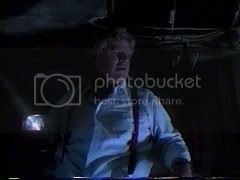 Jamie, meanwhile, steals the truck of an angry motorist (who quickly becomes Michael's next victim) and flees to a dark and empty bus station where she calls in to a radio show that happens to be doing a broadcast about the Haddonfield murders. Jamie gets on the air, begging for help and warning of Michael's imminent return. Trapped, she proceeds to hide in the bathroom where Michael nearly catches her. She narrowly makes it out alive and again drives away. Jamie is still not safe, as she is forced off the road by a presumably stolen van driven by Michael. Beaten and exhausted, she makes her way inside of an old barn where Michael is waiting for her. He kills Jamie by pushing her into a corn thresher, only to find that Jamie does not have the baby. Meanwhile, Tommy Doyle (Paul Stephen Rudd), the child Laurie Strode babysat in the first film, has his eye on a family who's moved into the old Myers house across the street from the boarding house where he lives. 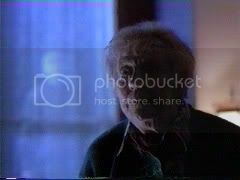 The boarding house is run by a mysterious old woman named Minnie Blankenship (Janice Knickrehm). For seventeen years, Tommy has been obsessed with finding the truth behind the murderous motives of Michael Myers. After hearing Jamie begging for help on a local radio show, Tommy finds her baby at the bus station and takes him into his care, who he then names Stephen. 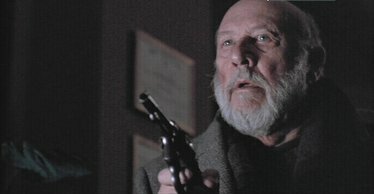 He runs into Dr. Loomis (Donald Pleasence) at the Haddonfield Memorial Hospital and tells him of a family living in the old Myers house when the two are convinced Michael has indeed come back to Haddonfield. The people living in the Myers house are relatives of the Strode family (Laurie Strode's adoptive parents), and among the current residents are Kara Strode (Marianne Hagan) and her son, Danny (Devin Gardner), Kara's teenage brother, Tim (Keith Bogart), and her parents, the doting mother Debra (Kim Darby) and abusive father John (Bradford English). 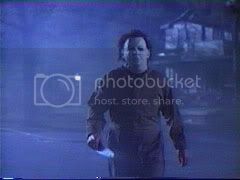 One by one, Michael stalks each of the Strodes, trying to get to Stephen. Across the street, Tommy reveals to Kara that he believes Michael has been marked with a runic symbol called Thorn (or Thurisaz), that druid astronomers claimed was originated from a constellation of stars that appear on Halloween night from time to time (whenever it appears, Michael appears, explaining why Michael appears a few number of years after he's been in a near-death-experience). It is an ancient Druid curse that represented a demon that spread sickness and caused mad destruction on druid tribes. 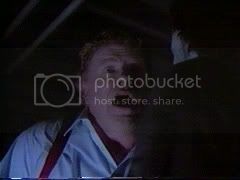 In order to prevent the tribes from dying, each tribe had to inflict the curse on one child from each tribe, so each child can offer the blood sacrifice of its next of kin on the night of Samhain (aka Halloween), because the sacrifice of one family meant sparing the lives of an entire tribe, which is the reason why Michael is trying to kill Stephen. If Michael did succeed in killing his entire family, the curse would be passed on to another child. 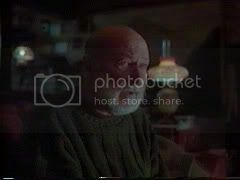 While Tommy is out looking for Dr. Loomis, Mrs. Blankenship reveals to Kara (after talking to Danny) that she was babysitting Michael Myers when he killed his sister 32 years ago, and Danny hears the "voice", just like Michael Myers heard when she was babysitting him (implying that Danny is the next "child" to be cursed with Thorn). The "Man in Black" finally reveals himself as Dr. Wynn from the original Halloween. After a terrifying showdown, the cult takes Kara, Danny, Stephen, and Michael back to Smith's Grove Sanitarium, with Tommy and Dr. Loomis following them. Loomis confronts Dr. Wynn (Mitchell Ryan), who credits Loomis for first discovering the unending power of Michael�s embodied evil. Wynn plans to use Stephen to renew the next cycle of cosmic evil power and invites Loomis to join him. Meanwhile, Tommy finds Kara locked in a room in the maximum security ward, and they continue on to find Danny and Stephen. 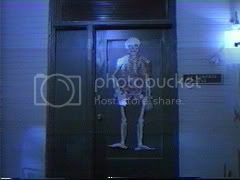 In the hallway, they see Dr. Wynn and several surgeons talking about the genetic engineering experiment they're working on. They then walk into an operating room and Tommy and Kara walk into the room next to it, where they find the children. They watch through a two-way mirror as Dr. Wynn and the surgeons prepare to perform the genetic engineering operation possibly on Danny. 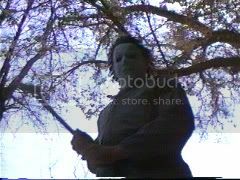 But Michael interrupts the procedure, walking in with a surgical machete in hand and promptly slaughtering them all. Tommy, Kara, and the kids run with Michael in hot pursuit until they come to a locked gate. With nowhere to go, the group hides in a high-tech med lab. Inside the lab, Kara notices some tanks with what looks like to be baby fetus' inside each one of them with a chart with runes translated into scientific letter codes next to them. As what it appears to be, Dr. Wynn and the Sanitarium crew are not the "Cult of Thorn" at all but just cult geneticists trying using Michael's evil power for their own experiments which involved cloning him. The fetuses are actually failed attempts by the crew to engineer a new child to harness the power of Thorn (Wynn and his staff has possibly been using the women of the institution for their experiments by performing in vitro fertilization on them. Their experiments have failed, but when they tested it on Jamie, it finally worked and possibly kidnapped Kara to test their experiments on her). Michael breaks into the room and out of nowhere Tommy injects him with tranquilizers of corrosive chemicals and beats him in the head with a lead pipe. As Dr. Loomis, Tommy, Kara, Danny, and the baby Stephen are about to escape, Loomis tells them to go on without him because he has "unfinished business" to do. Back inside the building, Michael's mask is lying on the floor and Loomis screams.